Here’s a shout-out to the Good Neighbor Pharmacy (GNP) owners who achieved top honors in the J.D. Power and Associates 2010 U.S. National Pharmacy Study, released September 21. The study, now in its fourth year, measured customer satisfaction with pharmacies in two segments: brick-and-mortar and mail-order. The study includes chain drugstores, supermarkets, and mass merchandisers. Five key factors that contribute to customer satisfaction with brick-and-mortar pharmacies were examined, including prescription ordering and pickup process, store, cost competitiveness, nonpharmacist staff, and pharmacists. Among chain drugstore pharmacies, GNP ranked highest in customer satisfaction, followed by Health Mart and The Medicine Shoppe Pharmacy. 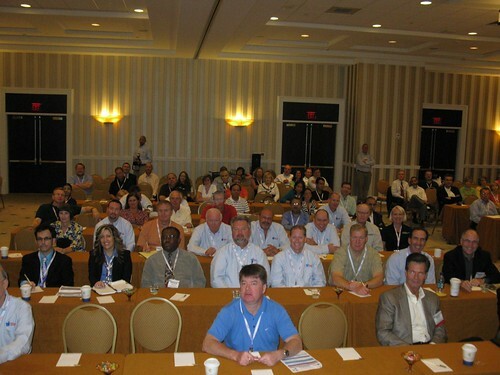 Pictured here is the audience of owners and AmerisourceBergen Corporation/GNP leadership and staff, in whose meeting I participated last week at National Harbor in Maryland. We talked about the Affordable Care Act and opportunities for innovation in practice. It was a real treat for me to spend some quality time with them.